This is my "go to" recipe for onion gravy. It's simple to make and it goes with EVERYTHING! Are you making Toad in the Hole? You definitely need onion gravy. Or how about a meatloaf smeatloaf double beatloaf? Yup. You definitely need onion gravy to go with it. Yes, I know it only take 5 seconds to open up a jar of brown gravy, but seriously, this is definitely one of those times where it's better when YOU make it. It really only takes a few extra minutes to make, and it goes perfectly over a pile of mashed potatoes or even just a simple bowl of rice. So, the next time you're having a roast beast or Salisbury steaks, give this one a try. I think you'll love it! Oh, and be sure to read the tips after the recipe for a few helpful ideas. Slice onions and place in a large saute pan along with the oil over medium heat. Slowly and patiently saute the onions until they're soft and caramelized. This should take about 8-10 minutes. Add the Worcestershire sauce and stir again. Stir in the flour and cook for a minute or two longer. Add the broth, salt, and pepper. Turn the heat up to medium high, just to bring it up to heat. Keep stirring as it thickens. Finish it by stirring in a pat of butter. Adjust seasoning if needed. Serve. Be sure to keep the heat low to medium as you caramelize the onions. You don't want the heat to be too high. That'll brown the onions too quickly. Just keep it nice and slow. For a little extra layer of flavor, try adding a few pinches of fresh thyme leaves. You can easily use butter instead of oil. Just omit the pat of butter at the end. It's really just there for flavor and also to make everything nice and rich and glossy. Are you serving chicken? Use chicken broth! Are you vegetarian or vegan? Use vegetable broth! 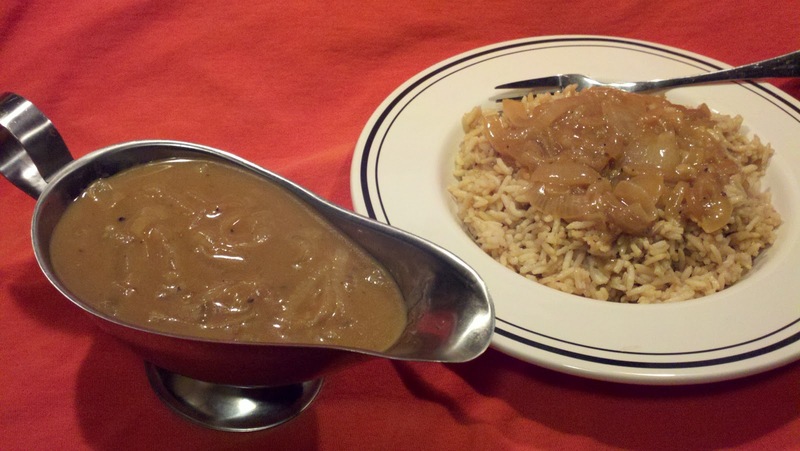 You can also make this a mushroom gravy by substituting mushrooms for the onions. Everything else stays exactly the same. You could also ADD mushrooms to it and make a mushroom and onion gravy. MMM that sounds good.... doesn't it? and btw... don't you just love my Aladdin's lamp gravy boat??? hee hee!